Rising inequality means that although we are seeing broad-based wage growth, ordinary workers are just making up lost ground rather than getting ahead. The bottom seven deciles have seen annual growth of hourly wages of 0.5 percent or less since 2000. 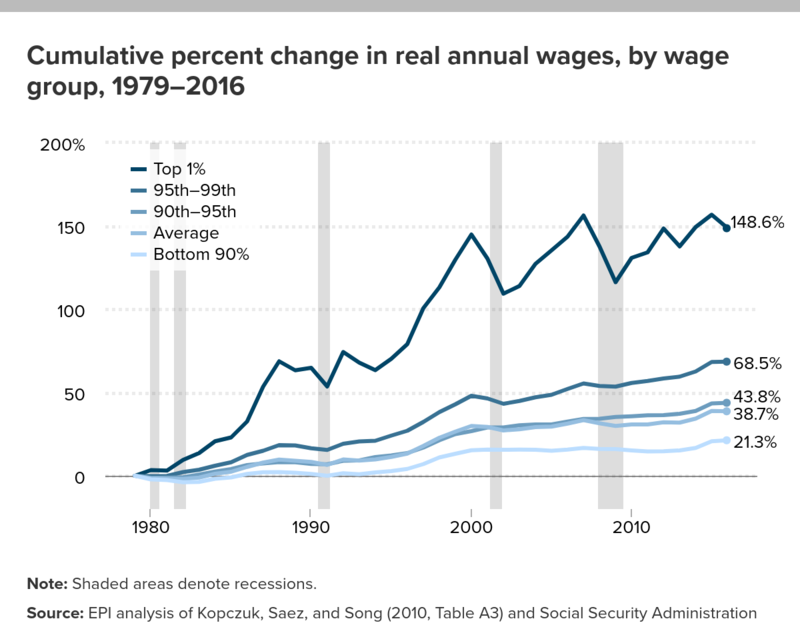 The way rising inequality has directly affected most Americans is through sluggish hourly wage growth in recent decades, despite an expanding and increasingly productive economy. For example, had all workers’ wages risen in line with productivity, as they did in the three decades following World War II, an American earning around $40,000 today would instead be making close to $61,000 (EPI 2018e). 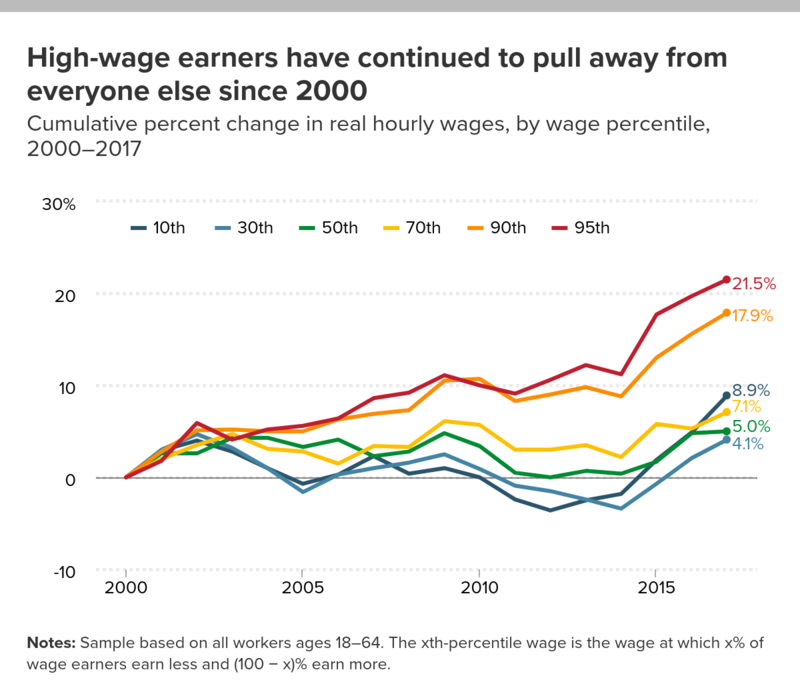 The latest data on hourly wages shows that the gap between those at the top and those at the middle and bottom has continued to increase through much of the 2000s. This report analyzes data from the Current Population Survey (CPS) and details the most up-to-date hourly wage trends through 2017 across the wage distribution and education categories, highlighting important differences by race and gender. By looking at real (i.e., inflation-adjusted) hourly wages by percentile, we can compare what is happening over time for the lowest-wage workers (those at the 10th and 20th percentiles) with wage trends for the highest-wage workers (those at the 90th and 95th percentiles). What stands out in this last year of data is that, while there have been welcome improvements, wage growth continues to be slower than would be expected in a stronger economy. Given this slow wage growth, policymakers should not presume that the economy has already achieved full employment. In short, papering over the damage done by the Great Recession does not constitute “mission accomplished” on wages. There remains much more work to be done to reduce wage disparities by gender and race and to reverse the damage done to wages by decades-long trends of rising inequality and wage stagnation. Nominal hourly wage growth in the CPS and the CES were fairly consistent from 2016 to 2017, and from 2000 to 2017 the two surveys exhibit similar trends when the CPS is smoothed out using a three-year moving average. However, the CPS exhibits more year-to-year volatility than the CES. This means that one-year changes in wages by decile in the CPS—while providing new and valuable information—should be taken with a grain of salt. Strong wage growth in the CPS between 2015 and 2016 is partially attributable to statistical volatility, as is the slower wage growth between 2016 and 2017. CPS and CES wage trends both show nominal wage growth that is still below levels consistent with the Federal Reserve’s inflation target and with long-run trend productivity growth—a sign that the economy still has considerable slack. Wage inequality. From 2000 to 2017, wage growth was strongest for the highest-wage workers, continuing the trend in rising wage inequality over the last four decades. From 2016 to 2017, strong growth continued at the top (1.5 percent at the 95th percentile), but the 10th percentile saw the strongest growth at 3.7 percent. Median wages grew only 0.2 percent. From 2016 to 2017, men saw wage declines at the top and bottom of their wage distribution. Modest wage gains at the median finally lifted men’s median hourly wages above their 2007 and 2000 levels. Women experienced a far more equal wage distribution, and their wage growth from 2016 to 2017 was relatively more broadly shared, with the strongest growth in the bottom 70 percent of the wage distribution. Gender wage gap. The gender wage gap at the median has narrowed since 2000, with a typical woman now paid 84 cents on the male dollar, although significant gender wage gaps remain across the wage distribution. The gender wage gap at the bottom has also narrowed since 2000. The gender wage gap at the top narrowed over the last year but remains wider than it was in 2000. The regression-adjusted average gender wage gap narrowed slightly from 2016 to 2017 and is currently at 22.0 percent. Wage growth in states with minimum wage increases. From 2016 to 2017, wages of the lowest-wage workers grew more in states that had increased their minimum wage. In states without minimum wage increases in 2017, the 10th-percentile wage rose 1.7 percent; in states with minimum wage increases in 2017, the 10th-percentile wage rose by 2.1 percent. The differential is larger when looking across recent years with many minimum wage increases: between 2013 and 2017, the 10th-percentile wage grew more than twice as fast in states with at least one minimum wage increase in that period versus states without. Wage growth by race/ethnicity. At every decile and at the 95th percentile, wage growth since 2000 was faster for white and Hispanic workers than for black workers. After suffering declines in the aftermath of the Great Recession, the 20th through 70th percentile of the black wage distribution is below or within only $0.03 of its 2000 level. From 2016 to 2017, the strongest wage growth among white workers was at the 95th percentile, while the median and the 10th-percentile wages both fell. From 2016 to 2017, Hispanic workers experienced more broadly based wage growth than black or white workers, with wages increasing across their wage distribution and growing more strongly at the median and the bottom than at the top. Except for the 10th and 30th percentiles, black wages fell across the entire wage distribution between 2016 and 2017. Racial/ethnic wage gaps. Throughout the wage distribution, black–white wage gaps are larger today than in 2000; conversely, Hispanic workers have been slowly closing the gap with white workers at the bottom 70 percent of the wage distribution. In 2000, the regression-adjusted Hispanic–white wage gap was larger than the regression-adjusted black–white wage gap. By 2017, the reverse was true. The regression-adjusted black–white and Hispanic–white wage gaps (controlling for education, age, race, and region) have become larger over the last year. The Hispanic–white wage gap has narrowed slightly over the last 17 years, while the black–white gap remains significantly larger today than it was in 2000, up 6.0 percentage points. Wage growth by education. From 2000 to 2017, the strongest wage growth occurred among those with an advanced degree, a college degree, and less than a high school diploma. 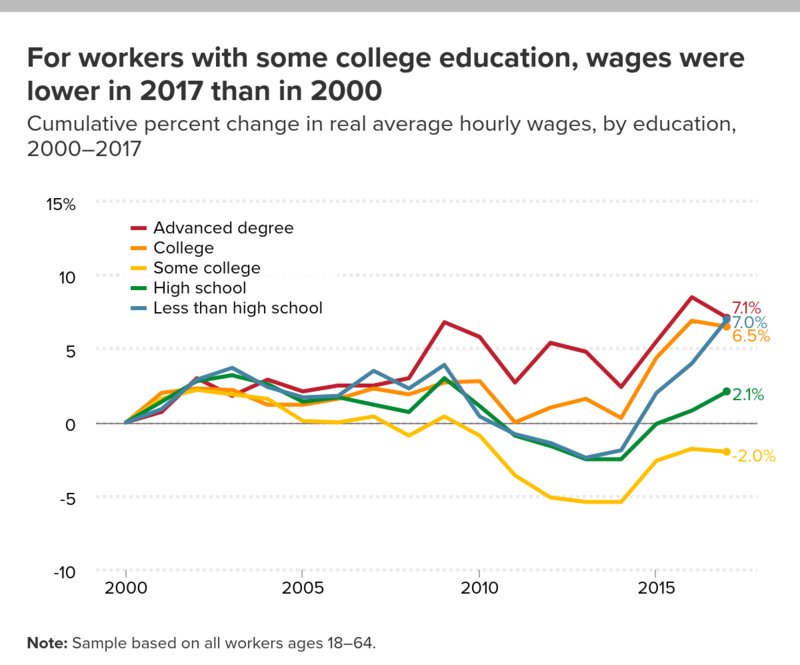 Over the last year, average wages of those with some college, college degrees, and advanced degrees fell, a reversal in trend for the more educated workers from the previous couple of years. Workers with some college still have lower wages today than in 2007 or 2000. Wage growth by education and gender. Since 2000, wage growth for those with a college degree was faster for men than for women, while wage growth for those with a high school diploma or some college was faster (or less negative) for women than for men. In general, the women’s wage distribution by educational attainment is more compressed, that is, the wage differences between workers of different levels of education are not as large for women as they are for men. 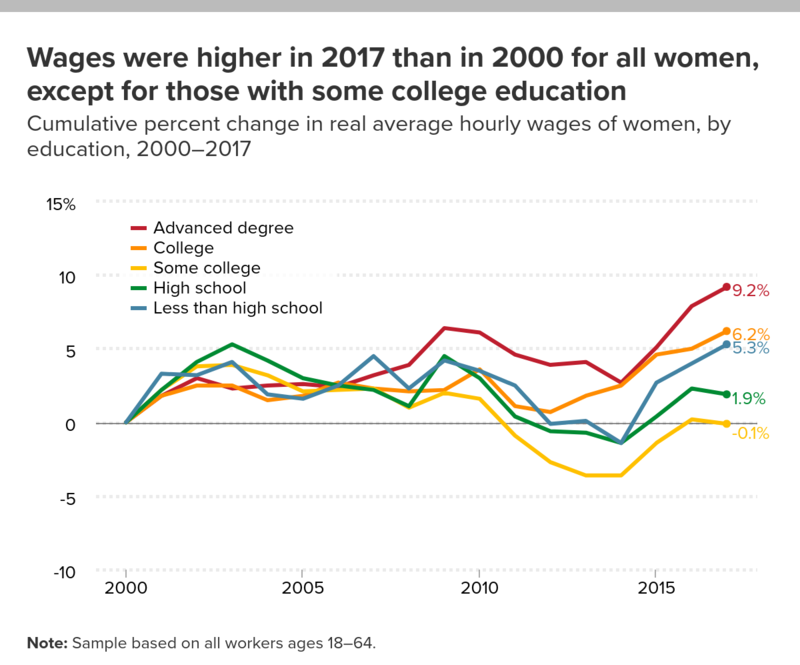 While there has been a slow narrowing of gender wage gaps since 2000 for those with high school diplomas and those with some college, gender wage gaps were wider than in 2000 among those with less than high school, college degrees, or advanced degrees. At every education level, women are paid consistently less than their male counterparts. Wage growth by education and race/ethnicity. From 2000 to 2017, wage growth for white and black workers tended to be faster (or less negative) for those with more education than those with less education. Average wages grew faster among white and Hispanic workers than among black workers for all education groups from 2000 to 2017. Among black workers, only college degree holders had higher wages than in 2000, but their wage growth was considerably slower than white or Hispanic workers with college degrees. From 2016 to 2017, wage growth was weak (or fell outright) for those with college or advanced degrees in all racial/ethnic groups, while wage growth was strongest for both black and white workers with less than a high school diploma. Black–white wage gaps by education were larger in 2017 than in 2000 for all education groups, while Hispanic–white wage gaps were narrower for workers with less than high school and high school diploma levels of education. At every education level, workers of color were paid consistently less than their white counterparts. Wage inequality and the college premium. Over 2000–2017, the boost to wages that comes from earning a college degree increased, but nowhere near fast enough to explain the total rise in wage inequality over that time. Despite weak wage growth in the past year for workers with four-year college degrees, over the longer term (since 2000 and 2007) these workers have seen stronger wage growth than those with high school diplomas. While those with college degrees saw wage growth of 6.5 percent from 2000 to 2017, educational attainment has not been sufficient to return many workers to where they were before the recessions of the 2000s: the bottom 50 percent of workers with a college degree still have lower wages than they did in 2000 or 2007. The regression-adjusted college wage premium fell from 2016 to 2017, but it is higher than where it was in 2000. The college premium is the percent by which hourly wages of four-year college graduates exceed those of otherwise equivalent high school graduates. The rise in the overall college premium has been driven by increases for men. Comparisons between the two main wage surveys—CPS and CES—show year-to-year volatility but fairly consistent trends over time. The Bureau of Labor Statistics releases two surveys every month as part of their Employment Situation report: the Current Population Survey (CPS) and the Current Employment Statistics survey (CES). The CPS collects employment and demographic information from households, while the CES collects information from employers’ payroll records. We use CPS data because they allows us to examine changes in wages by demographic characteristics such as gender, race and ethnicity, and education. However, the CPS has some weaknesses; in particular, it draws data from a much smaller sample than the CES does. Therefore, we compare CPS wage trends with CES wage trends in order to get a more complete picture of the strength of wage growth in the economy today. When we do so, we find that the CPS exhibits significantly more volatility than the CES, due primarily to its smaller sample size (see Figure A). 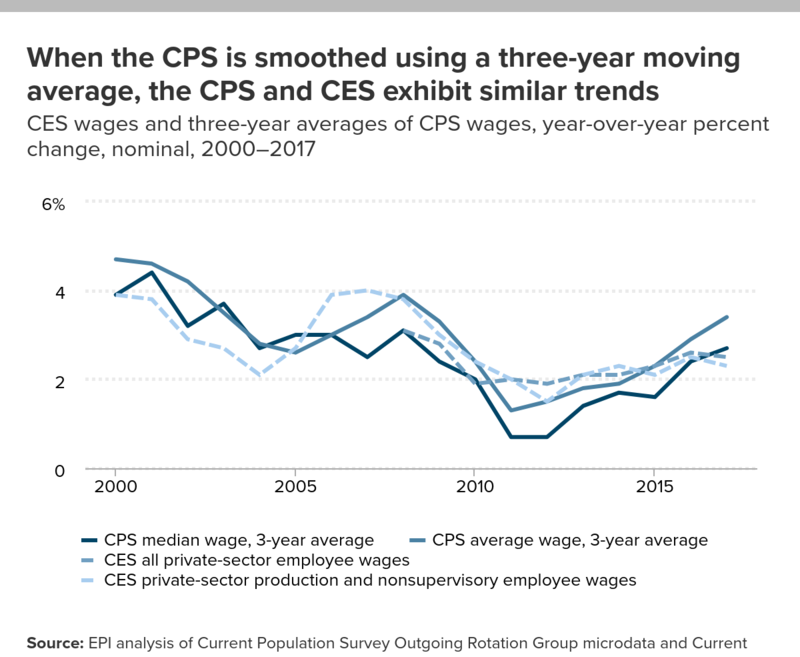 However, when the CPS is smoothed using a three-year moving average, the CPS and CES show similar wage trends (see Figure B). A more detailed analysis of wage data in the CPS and the CES follows. From 2016 to 2017, the U.S. economy experienced nominal hourly median and average wage growth of 2.4 percent and 2.6 percent, respectively, according to data from the Current Population Survey Outgoing Rotation Group (CPS-ORG). Similarly, the CES—the series that provides wage data as part of the Bureau of Labor Statistics’ monthly jobs report—illustrated similar growth in average wages for all private-sector workers and for production/nonsupervisory workers of 2.5 percent and 2.3 percent, respectively. It is unsurprising that median wage growth would be a bit weaker than average in the CPS, as such a difference is indicative of rising inequality. It is also unsurprising that wage growth for production/nonsupervisory workers from the CES would be lower than for all private-sector workers because the former category (constituting roughly 82 percent of private payroll employment) excludes managers and supervisors, who are likely to be more highly paid on average (EPI 2018d). However, trends in wage growth have not always been consistent between the two surveys in a given year. From 2015 to 2016, the CPS-ORG showed relatively strong growth in nominal median hourly wages of 4.4 percent (Gould 2017). At the same time, the CES showed relatively weaker wage growth for private-sector workers and production/nonsupervisory workers over the same year, averaging 2.6 percent and 2.5 percent, respectively. This lower level of growth registered in the CES data is notably below levels consistent with Federal Reserve targets for inflation and long-run trend productivity growth (EPI 2018c). The 4.4 percent growth in the CPS-ORG was particularly striking in a year in which inflation rose only 1.3 percent. And this level of growth would be highly suggestive of a stronger economy than is indicated by other labor market statistics. While trends in the last year are relatively more consistent between the two surveys than in the past, it is still worthwhile to take a deeper look at prior trends and why they may be different across the two surveys. Here are the weeds of this argument. The CPS and the CES provide the main monthly statistics on the labor market. The CPS is a sample survey of about 60,000 households conducted by the U.S. Census Bureau for the Bureau of Labor Statistics (BLS). Its sample, based primarily on the U.S. Census, is designed to reflect the entire civilian noninstitutionalized population. On the other hand, the CES is collected from employers’ payroll records of about 651,000 individual worksites. This information is gathered by the BLS from a sample based on unemployment insurance tax records. Both the household survey and payroll survey data are collected for the week of each month (or pay period) containing the 12th of that month (BLS 2018). Given the larger sample size and the benchmarking of CES employment to unemployment insurance tax records, it has been well established that the CES is the better survey for assessing overall employment growth (Gould 2003). The CPS samples respondents for eight months total—respondents are “in” for four months in a row, out for eight, and in for four months again. Data on wages from the CPS come from the subsample surveyed in the fourth and eighth months of their time in the survey, that is, questions about wages and earnings are asked only in the last month of each four-month period that a respondent is in the survey. The surveyed group is referred to as the “outgoing rotation group” (ORG) because they are in the last month of their survey rotation for that year. Because respondents are surveyed about wages and earnings only one month out of four, the sample size is only one-fourth of the original 60,000 households surveyed in any given month. Furthermore, the sample may be additionally reduced because wage data is only available for the share of those surveyed who are workers. Therefore, if the CES survey is better on measuring employment changes because of limited data for the CPS, then the problem with comparable wages is likely to be worse. Figure A illustrates year-over-year percent changes in nominal wage growth for all four series in question: the CPS median wage and the CPS average wage (solid lines) and the CES private-sector wage and the CES production/nonsupervisory wage (dashed lines). For EPI’s methodology and sample restrictions in the calculations of means and median, see EPI 2018b. It is clear from Figure A that both CPS-ORG series exhibit far more volatility than the CES wage series do. This is not surprising given the differences in survey features, notably the significantly smaller sample size in the CPS. Looking only at last year’s CPS and CES numbers, one might be tempted to report a slowdown in wage growth from 2016 to 2017, but I would suggest attributing much of this “slowdown” to a reversion to the mean in the jumpier survey. The reversion to a very close matching in wage growth of the CES all private-sector employee series in the case of the CPS average and the CES production/nonsupervisory employee series in the case of the CPS median is merely a matter of odds; however, it allows us to tell a rather conveniently consistent story of wage growth. Using my preferred metric, typical (median) nominal hourly wages, we see that from 2016 to 2017, wages grew 2.4 percent. Given the Federal Reserve’s 2 percent inflation target and 1.5 percent long-run trend productivity growth, wages should be growing at least 3.5 percent for workers to reap the benefits of economic growth (EPI 2018c); 2.4 percent clearly falls short of that. This relatively slow rate of nominal wage growth provides a strong indication that the economy still has a ways to go before reaching full employment. Given that workers have limited leverage to bid up their wages, the economy is clearly exhibiting a fair amount of slack. Figure B smooths out the CPS median and average series, creating a simple three-year moving average (smoothing medians without constructing medians using the pooled series) to compare with the one-year averages in the CES. It is striking how similar the trends now appear, providing further evidence that larger changes are driven by data volatility. 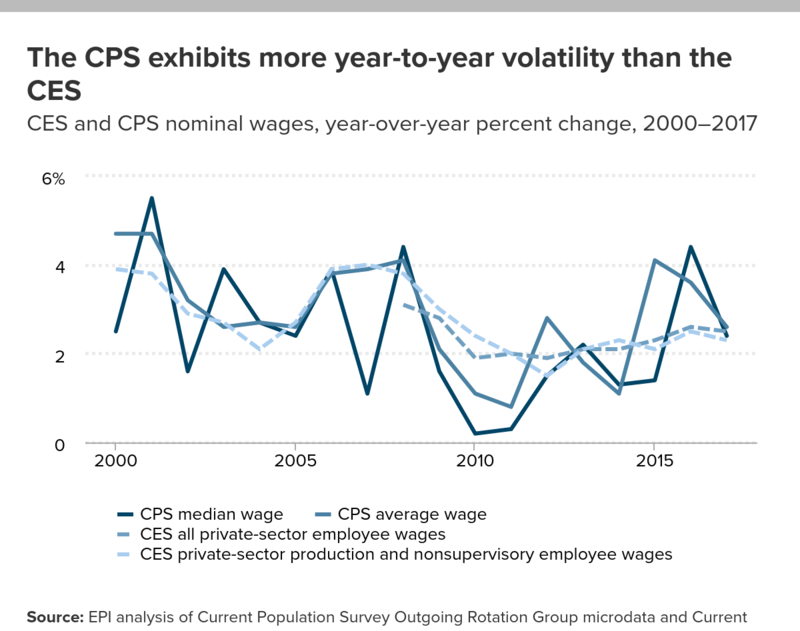 While wage growth was stronger in the CPS from 2016 to 2017, much of that growth can be attributed to statistical volatility as opposed to genuine wage growth for workers. Figure B shows wages moving in the right direction but decidedly not exceeding target inflation plus productivity growth for the median worker. While the CPS’s weaknesses are clear, it remains the best series for measuring wages and wage growth by demographic characteristics as well as across the wage distribution. I suggest taking swings in year-to-year differences with a large grain of salt and paying more attention to longer-term trends. However, I do report cross-cutting differences from the CPS for the most recent year; a look at the most current available data remains valuable to understanding how today’s economy is serving U.S. workers across the labor market. Wage growth from 2000 to 2017 continues long-run trends in rising inequality. 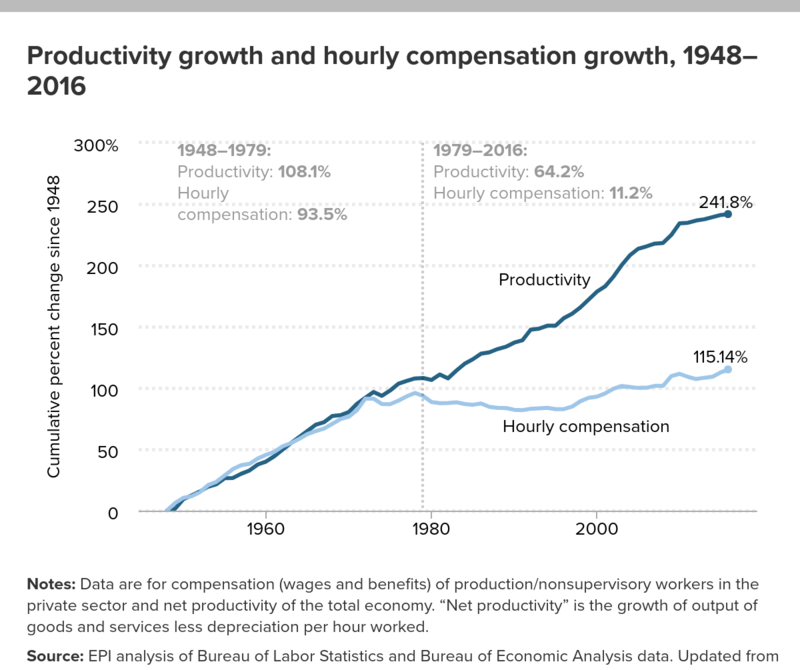 Since 1979, hourly pay for the vast majority of American workers has diverged from economy-wide productivity, and this divergence is at the root of numerous American economic challenges. After tracking rather closely in the three decades following World War II, growing productivity and typical worker compensation diverged (shown in Appendix Figure A). From 1979 to 2016, productivity grew 64.2 percent, while hourly compensation of production and nonsupervisory workers grew just 11.2 percent. Productivity thus grew nearly six times faster than typical worker compensation. A natural question that arises from this story is just where did the “excess” productivity go? A significant portion of it went to higher corporate profits and increased income accruing to capital and business owners (Bivens et al. 2014). But much of it went to those at the very top of the wage distribution, as shown in Appendix Figure B. The top 1 percent of earners saw cumulative gains in annual wages of 148.6 percent between 1979 and 2016—far in excess of economy-wide productivity growth and nearly four times faster than average wage growth. While the CPS-ORG—the primary data set used in this paper—does not allow disaggregation within the top 5 percent of the earnings distribution, it is still instructive for measuring the growth in wage inequality over the last 40-odd years. Appendix Figure C illustrates that for all but the highest earners, hourly wage growth has been weak. If it hadn’t been for the period of strong across-the-board wage growth in the late 1990s, wages for most would have fallen outright. Median hourly wages rose 9.5 percent between 1979 and 2017, compared with an increase of 4.4 percent for the 10th-percentile worker (i.e., the worker who earns more than only 10 percent of workers). Over the same period, the 95th-percentile worker saw growth of 51.7 percent. Wage growth since the Great Recession has continued to follow this trend: slower growth for most compared with faster growth for those at the top. Table 1 shows hourly wages by wage decile (and at the 95th percentile) and includes data from 2000 (the previous business cycle peak), 2007 (the most recent business cycle peak), and the two most recent years of data (2016 and 2017). For a full discussion of EPI’s use of the CPS-ORG data, see EPI’s methodology for measuring wages and benefits (EPI 2018b). In the full business cycle from 2000 to 2007, growth was relatively slow overall and relatively unequal; the gains at the 90th and 95th percentiles were higher than at the middle or bottom of the wage distribution. 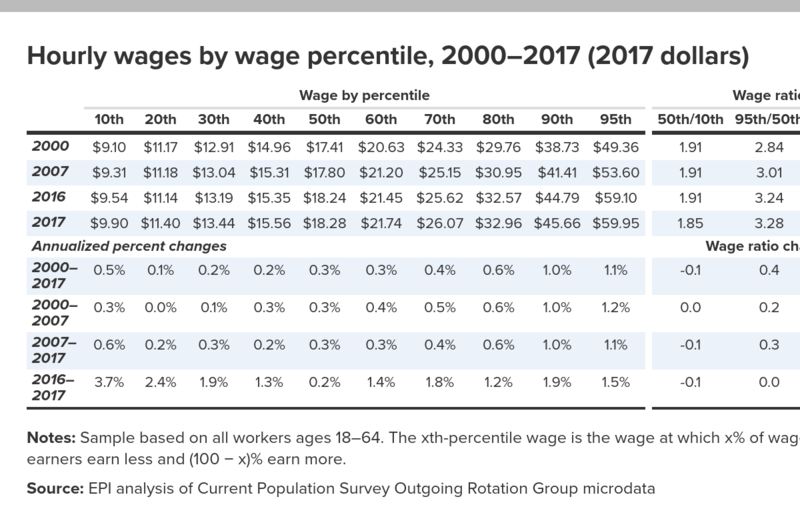 After growing at practically the same rate from 2000 to 2007, the bottom grew about twice as fast as the middle from 2007 to 2017, narrowing slightly the ratio of wages at the 50th and 10th percentiles of the wage distribution (i.e., the 50/10 wage gap, or the gap between the middle and the bottom). However, because of the large and disproportionate gains at the top, both the 95/50 gap (the gap between top and the middle) and the 95/10 gap (the gap between the top and the bottom) grew substantially from 2007 to 2017. Notes: Sample based on all workers ages 18–64. The xth-percentile wage is the wage at which x% of wage earners earn less and (100 − x)% earn more. With the caveat that, as discussed above, we need to be careful to not assign too much meaning to one-year changes given concerns about data volatility, we note the following trends over the past year: The one-year change in the median wage from 2016 to 2017 was a paltry 0.2 percent, compared with 1.5 percent at the 95th percentile and 3.7 percent at the 10th percentile. With the recent bump at the 20th percentile, 2017 marks the first year that every wage decile shown has finally exceeded its 2007 and 2000 levels. 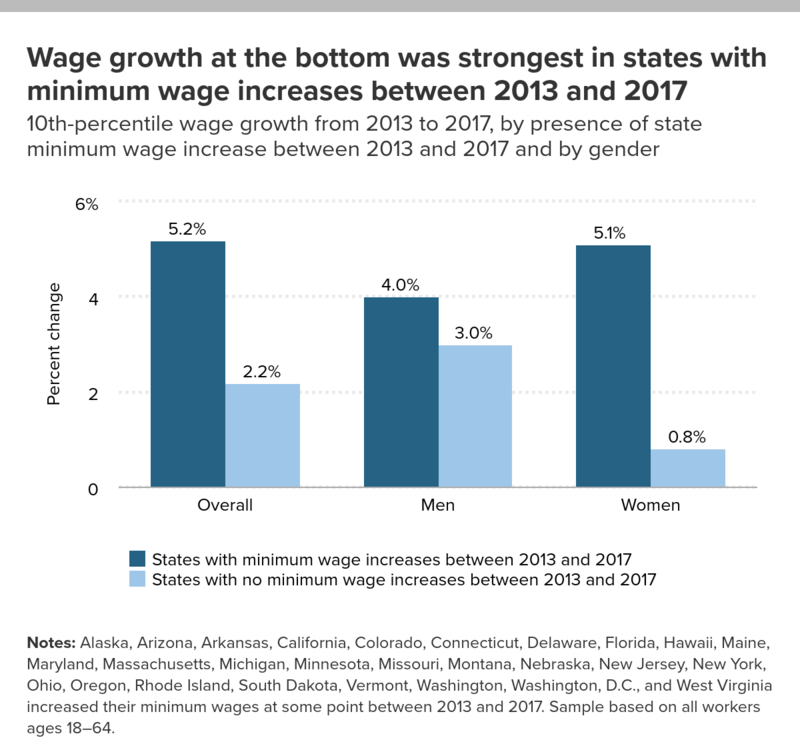 The continued relatively strong growth at the 10th percentile may have been boosted by state-level minimum wage increases, as discussed below. 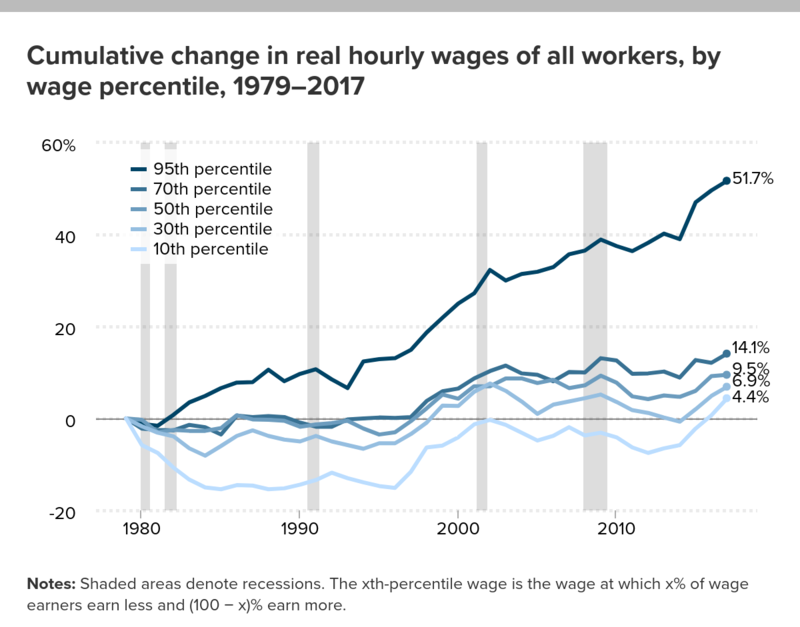 Figure C illustrates the trends in wages for select deciles (and the 95th percentile), showing the cumulative percent change in real hourly wages from 2000 to 2017. The overall story of inequality is clear. The lines demonstrate that those with the highest wages have had the fastest wage growth in recent years. From 2000 to 2017, the 95th-percentile wage grew about four times faster than the wages at the median. By 2017, the 95/10 ratio had grown to 6.1 from 5.8 in 2007 and 5.4 in 2000 (see Table 1). This means that on an hourly basis, the 95th-percentile wage earner was paid 6.1 times what the 10th-percentile wage earner was paid. Similar trends are found in the 95/50 wage ratio, with those at the top pulling away from those at the middle. In 2017, the 95th-percentile wage earner was paid 3.3 times more than the median worker compared with 3.0 times more in 2007 and 2.8 times more in 2000. Men are paid more than women; wage inequality is higher and growing more among men than among women. Analyzing wages at different points in the wage distribution over time can mask different outcomes for men compared with women. Table 2 replicates the analysis of wage deciles for men and women separately, with a comparison of gender wage disparities over 2000–2017. Figures D and E accompany this table, illustrating the cumulative percent change over 2000–2017 in real hourly wages of men and women at select wage percentiles. Long-term trends suggest that low- and middle-wage men have fared comparatively poorly and that wage gaps between the top and the middle (the 95/50 ratio) and the top and the bottom (the 95/10 ratio) have increased more for men than for women. Male wages at the 95th percentile grew 28.9 percent from 2000 to 2017, twice as fast as at the 90th percentile (14.1 percent), while the median male wage barely budged, rising only 0.6 percent over the entire 17-year period. From 2016 to 2017, men saw their wages fall at the top and bottom of the wage distribution: a 0.9 percent drop at the 95th percentile and 0.8 percent and 0.6 percent decline at the 10th and 20th percentiles, respectively. In the last year, the median male wage grew a more respectable 1.2 percent, bringing the median wage to just above its 2007 and 2000 levels. 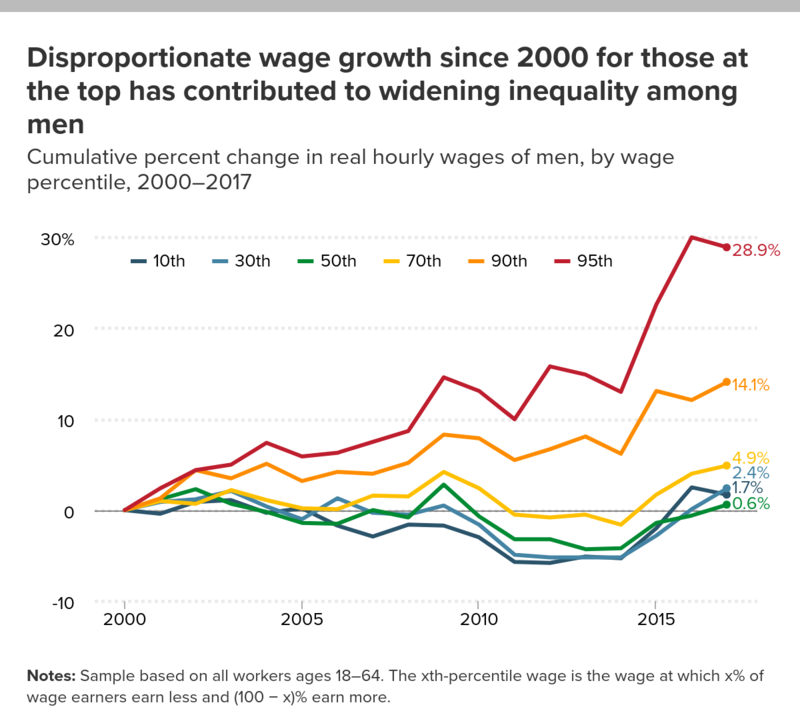 Women also experienced a growth in wage inequality from 2000 to 2017, with the 95th percentile continuing to pull away from the middle and bottom of the wage distribution. 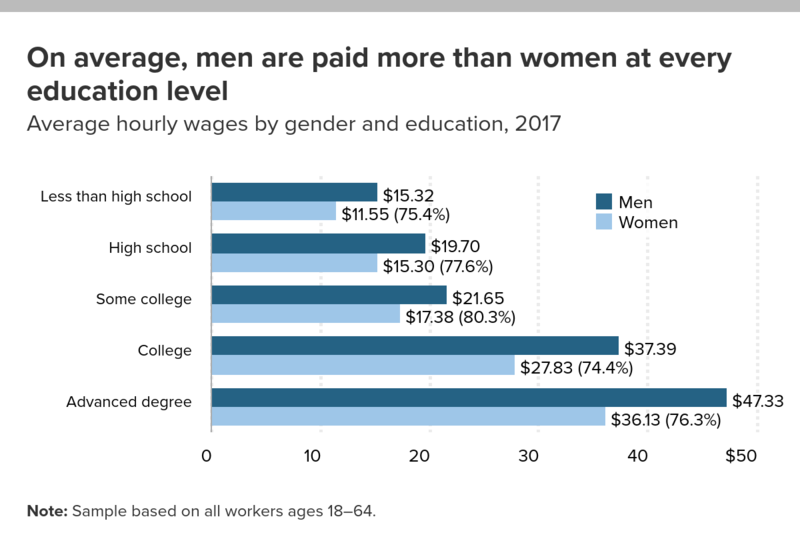 However, wage inequality among women in 2017 was not as high as it was among men; the 95th-percentile woman was paid 5.5 times more than the 10th-percentile woman, while the 95/10 ratio among men was 7.0. 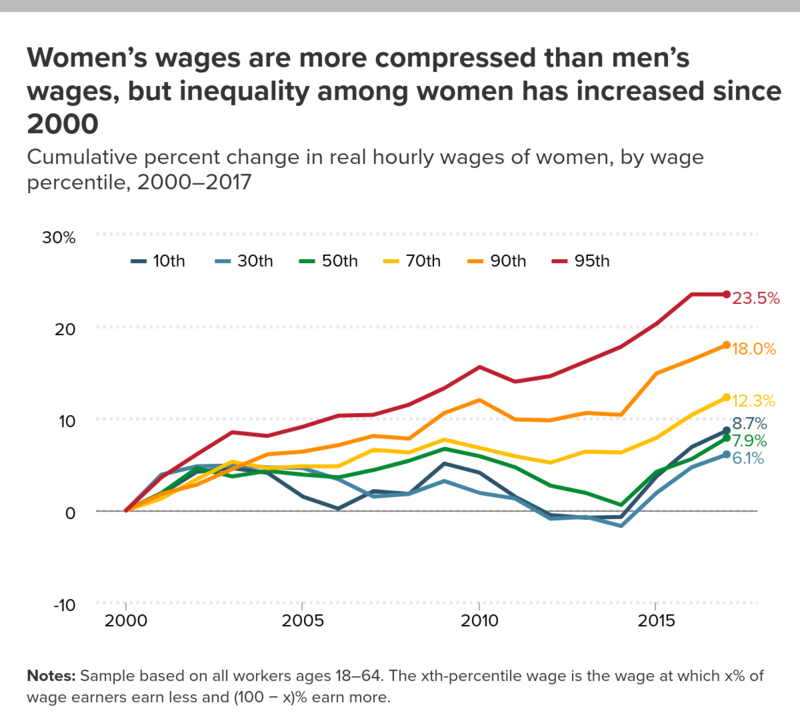 While inequality has grown modestly among women, the growth in women’s wages is more broadly shared across the wage distribution than men’s, with stronger growth among the bottom 70 percent than among the top earners from 2016 to 2017. 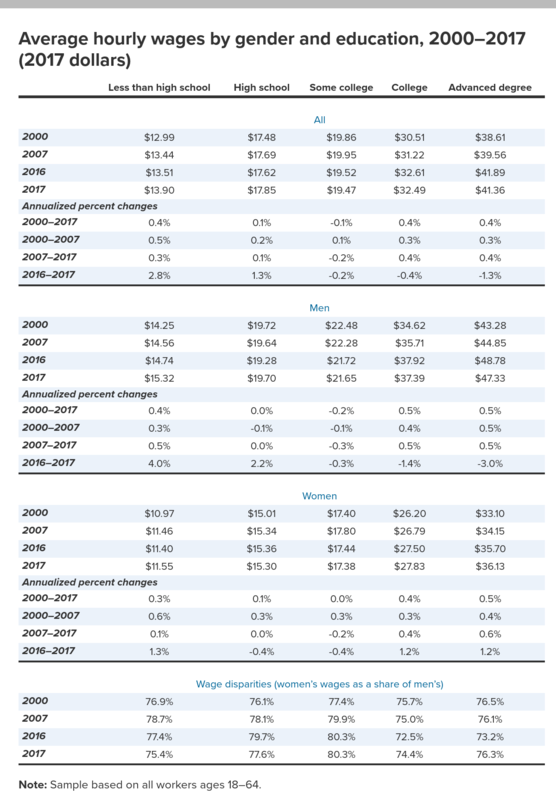 In addition, women’s wages at all deciles increased from 2016 to 2017, and women at all deciles had higher wages in 2017 than in 2007 or 2000. While significant gender wage gaps remain across the wage distribution, the gender wage gap at the median saw some continued improvement, with the typical woman now earning 84 cents on the male dollar. If we can stem the tide of rising inequality and claw back the disproportionate gains going to those at the top of the overall wage distribution, it would be economically feasible to see both men’s and women’s wages rise while simultaneously closing the gender wage gap (EPI 2018a). After widening from 2015 to 2016, the gender wage gap at the top of the wage distribution narrowed somewhat from 2016 to 2017, though it remains wider than it was in 2000. Over the last year, the gender wage gap at the bottom of the distribution narrowed and remains the narrowest across the distribution, likely because of the wage floor. 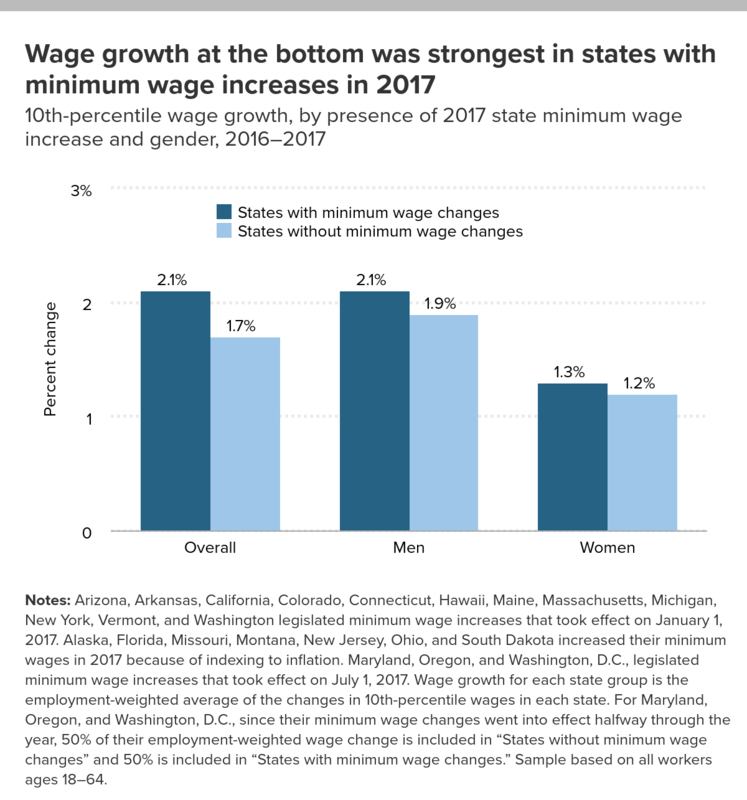 Wage growth at the bottom was faster in states that increased their minimum wage in 2017. 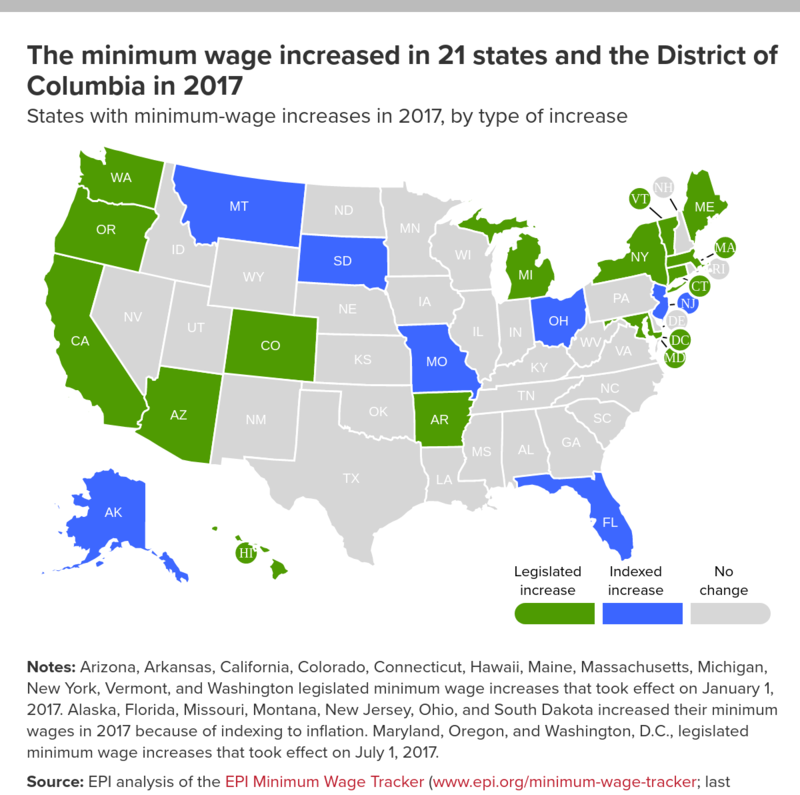 In 2017, the minimum wage was increased in 14 states and the District of Columbia through legislation and in seven states because the minimum wage is indexed to inflation in those states. Most of these increases occurred at the start of the year, though some occurred later in the year. Figure F displays in green the states with legislated minimum wage increases in 2017; states in blue had automatic increases resulting from indexing the minimum wage to inflation. Workers in states that increased their minimum wage in 2017 account for about 50 percent of the U.S. workforce. Comparing the average minimum wage in 2016 with the average in 2017, the amounts of the nominal minimum wage increases, legislated or indexed, ranged from $0.05 (or 0.5 to 0.6 percent) in Alaska, Florida, Missouri, and Ohio to $1.95 (or 24.2 percent) in Arizona. Notes: Arizona, Arkansas, California, Colorado, Connecticut, Hawaii, Maine, Massachusetts, Michigan, New York, Vermont, and Washington legislated minimum wage increases that took effect on January 1, 2017. Alaska, Florida, Missouri, Montana, New Jersey, Ohio, and South Dakota increased their minimum wages in 2017 because of indexing to inflation. Maryland, Oregon, and Washington, D.C., legislated minimum wage increases that took effect on July 1, 2017. A comparison of 10th-percentile wage growth among states grouped by whether they had a minimum wage increase or not yields highly suggestive results. As shown in Figure G, when looking at 10th-percentile wages, growth in states without minimum wage increases was slower (1.7 percent) than in states with any kind of minimum wage increase (2.1 percent). While admittedly a very small differential when disaggregated, this result does hold true for both men and women at the 10th percentile. The 10th-percentile men’s wage grew 2.1 percent in states with minimum wage increases, compared with 1.9 percent growth in states without any minimum wage increase, while women’s 10th-percentile wage grew 1.3 percent in states with minimum wage increases and 1.2 percent in states without. Notes: Arizona, Arkansas, California, Colorado, Connecticut, Hawaii, Maine, Massachusetts, Michigan, New York, Vermont, and Washington legislated minimum wage increases that took effect on January 1, 2017. Alaska, Florida, Missouri, Montana, New Jersey, Ohio, and South Dakota increased their minimum wages in 2017 because of indexing to inflation. Maryland, Oregon, and Washington, D.C., legislated minimum wage increases that took effect on July 1, 2017. Wage growth for each state group is the employment-weighted average of the changes in 10th-percentile wages in each state. For Maryland, Oregon, and Washington, D.C., since their minimum wage changes went into effect halfway through the year, 50% of their employment-weighted wage change is included in “States without minimum wage changes” and 50% is included in “States with minimum wage changes.” Sample based on all workers ages 18–64. It is not surprising that these differences are smaller than what has been seen in earlier years because as the economy gets closer to full employment, we would expect the 10th-percentile wage to increase across all states regardless of changes in the minimum wage (Gould 2017). Furthermore, 2017 changes in the minimum wage came on the heels of other recent changes to the minimum wage in many of the same states over the previous couple of years. In fact, when we compare states with any minimum wage change since 2013 with those without any, as shown in Figure H, the pattern is even more pronounced. Wage growth at the 10th percentile in states with at least one minimum wage increase from 2013 to 2017 was more than twice as fast as in states without any minimum wage increases (5.2 percent vs. 2.2 percent). As expected given women’s lower wages in general, this result is even stronger for women (5.1 percent vs. 0.8 percent). Notes: Alaska, Arizona, Arkansas, California, Colorado, Connecticut, Delaware, Florida, Hawaii, Maine, Maryland, Massachusetts, Michigan, Minnesota, Missouri, Montana, Nebraska, New Jersey, New York, Ohio, Oregon, Rhode Island, South Dakota, Vermont, Washington, Washington, D.C., and West Virginia increased their minimum wages at some point between 2013 and 2017. Sample based on all workers ages 18–64. From 2000 to 2017, within-group wage inequality grew for white, black, and Hispanic workers. 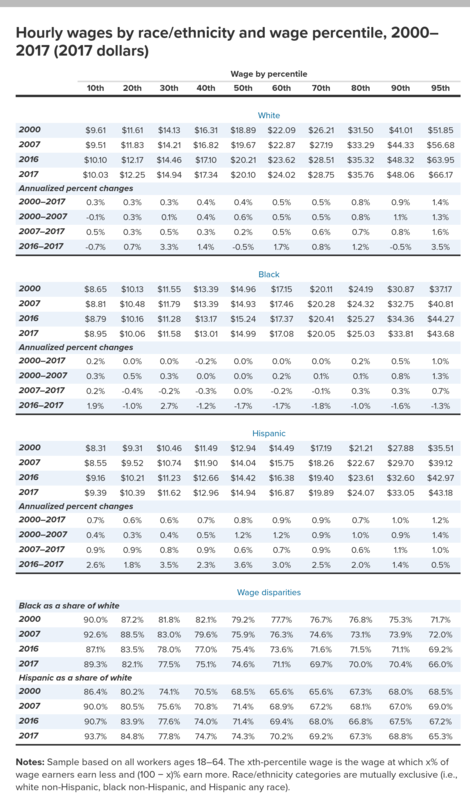 Table 3 examines wage deciles (and the 95th-percentile wage) for white non-Hispanic, black non-Hispanic, and Hispanic workers from 2000 to 2017. From 2000 to 2017, the strongest growth among white, black, and Hispanic workers occurred at the top of the wage distribution, a sign of growing within-group wage inequality. At every decile and at the 95th percentile, wage growth since 2000 has been faster for white and Hispanic workers than for black workers. After suffering declines in the aftermath of the Great Recession, the 20th through 70th percentiles of the black wage distribution are below or within $0.03 of their 2000 levels. Notes: Sample based on all workers ages 18–64. The xth-percentile wage is the wage at which x% of wage earners earn less and (100 − x)% earn more. Race/ethnicity categories are mutually exclusive (i.e., white non-Hispanic, black non-Hispanic, and Hispanic any race). From 2016 to 2017, the strongest wage growth among white workers was at the 95th percentile (3.5 percent), while the median and the 10th-percentile wage fell 0.5 and 0.7 percent, respectively. Hispanic workers experienced more broadly based wage growth with wages increasing across their wage distribution, with stronger growth at the median (3.6 percent) and the bottom (2.6 percent) than at the top (0.5 percent). Black wages fell across nearly the entire wage distribution from 2016 to 2017. (Again, when looking at all of these numbers, we need to keep in mind that the CPS data is subject to a certain amount of volatility from year to year; for data on black wages, that volatility is likely to be even more pronounced because of the smaller data sample represented by the black population.) The only notable diversions from these losses were increases at the 10th percentile (1.9 percent) and the 30th percentile (2.7 percent). It’s not surprising that the 10th-percentile wages grew faster among black and Hispanic workers as their 10th-percentile wage is lower and more likely to be impacted by the minimum wage changes discussed above. 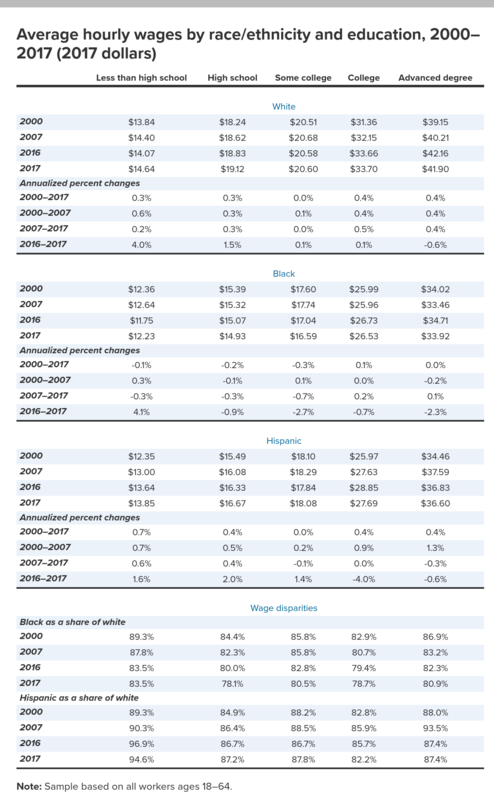 The bottom section of Table 3 displays wage disparities, showing black and Hispanic wages as a share of white wages at each decile of their respective wage distributions. Compared with white workers, black workers have been losing ground since 2000, with larger black–white wage gaps across the entire distribution. In 2000, black wages at the median were 79.2 percent of white wages. By 2017, they were only 74.6 percent of white wages. Conversely, Hispanic workers have been slowly closing the gap with white workers at the bottom 70 percent of the wage distribution. In 2000, median Hispanic wages were 68.5 percent of white wages, and, by 2017, they were 74.3 percent. The 95th-percentile Hispanic–white wage gap still remains wider than its 2000 level. The regression-adjusted black–white and Hispanic–white wage gaps (controlling for education, age, race, and region) have become larger over the last year (EPI 2018d). While the Hispanic–white wage gap has narrowed slightly over the last 17 years, the black–white gap remains significantly larger today (16.2 percent) than it was in 2000 (10.2 percent). In 2000, the Hispanic–white wage gap was larger than the black–white wage gap. In 2017, the reverse was true. Further, between 2000 and 2017 the regression-adjusted black–white wage gap widened significantly for both men (+5.3 percentage points) and women (+6.3 percentage points), while the Hispanic–white wage gap narrowed for men (−2.1 percentage points) and grew slightly for women (+1.7 percentage points). From 2000 to 2017, the strongest wage growth occurred among those with advanced degrees (7.1 percent), those with college degrees (6.5 percent), and those with less than a high school diploma (7.0 percent). The gains among those with less than a high school diploma were particularly striking in the last couple of years and grew the most of any group from 2016 to 2017 (2.8 percent). Given that these are often the lowest-wage workers in general, it is likely that some of these gains can be attributed to state-level increases in the minimum wage. Over the last year, average wages of those with some college, college degrees, and advanced degrees actually fell, a reversal in trend for the more educated workers from the previous couple of years (EPI 2018d). Workers with some college still have lower wages today than in 2007 or 2000. Note: Sample based on all workers ages 18–64. Figures J and K display the cumulative percent change in real hourly wages by education for men and women, respectively. 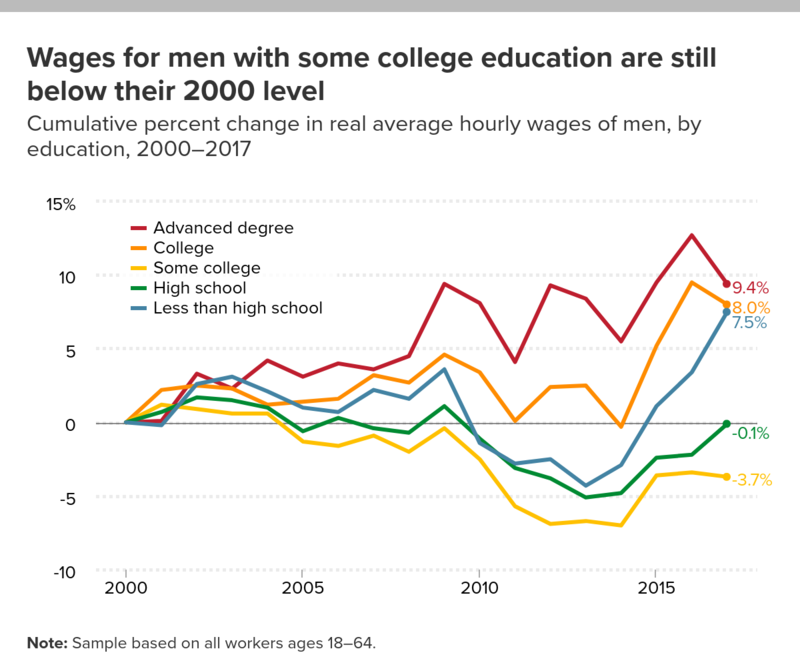 Since 2000, wage growth for those with a college or advanced degree was faster for men than for women, while wage growth for those with a high school diploma or some college was faster (or less negative) for women than for men. In general, the women’s wage distribution by educational attainment is more compressed, that is, the wage differences between workers of different levels of education are not as large for women as they are for men. For both men and women, the largest gains since 2000 were among those with a college or advanced degree. Wages of men with a high school diploma and with some college remain lower than their 2000 levels. Among women, all groups except for those with some college have now exceeded their 2000 wage levels. While there has been a slow narrowing of gender wage gaps for those with high school and some college since 2000, gender wage gaps are wider among those with less than high school or a college or advanced degree. As Figure L illustrates, women are paid consistently less than their male counterparts at every education level. Wage growth for white, black, and Hispanic workers tended to be faster for those with more education than those with less from 2000 to 2017 (Table 5). Average wages grew faster among white and Hispanic workers than black workers for all education groups (which is not surprising given that the same was true at all deciles of the wage distribution). Black workers with less than a college degree have lower wages today than in 2007 or 2000. Consistent with our findings on the relationship between education and earnings for all workers (see Table 4), wage growth was weakest (or fell outright) for those with a college or advanced degree for all groups over the last year, while wage growth was strongest for both black and white workers with less than a high school diploma. Black–white wage gaps by education were larger in 2017 than in 2000 for all education groups, while Hispanic–white wage gaps were narrower for workers with less than high school and high school diploma levels of education. 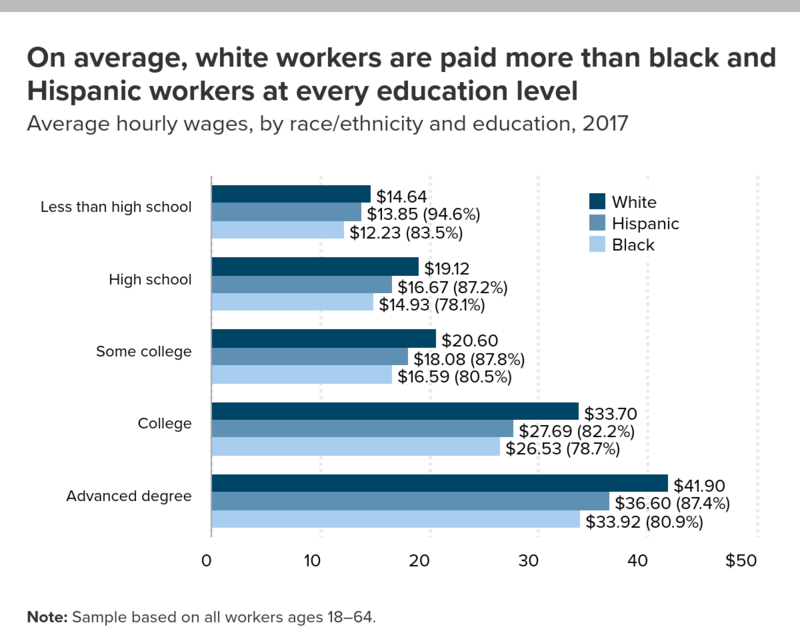 At every education level, black and Hispanic workers were consistently paid less than their white counterparts in 2017, while Hispanic workers were consistently paid more than black workers (Figure M). 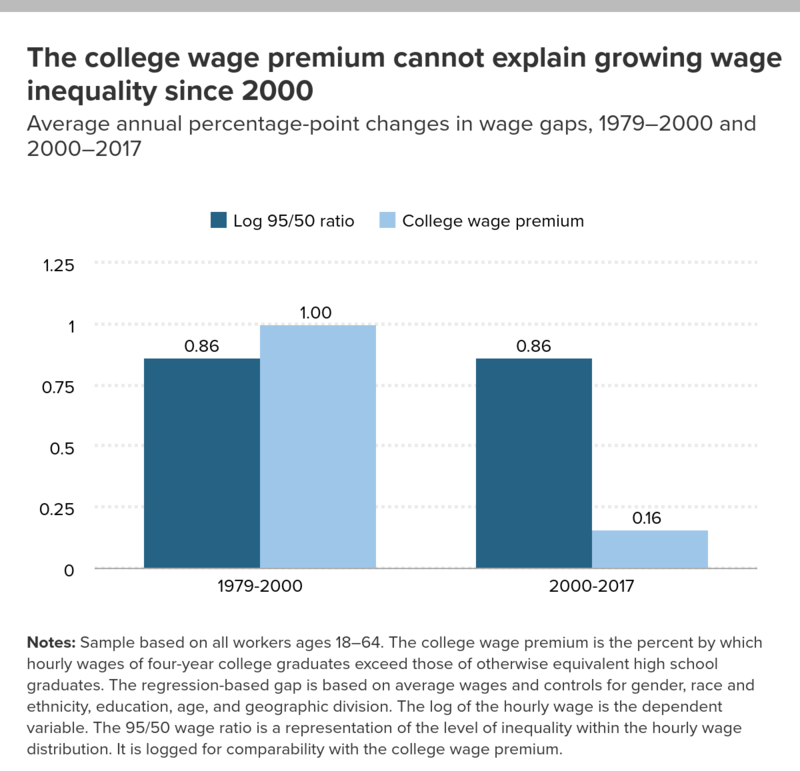 The college wage premium increased from 2000 to 2017, but not fast enough to explain growing wage inequality. As discussed in the previous section, wage growth among those with an advanced degree or college degree rose 7.1 percent and 6.5 percent, respectively, from 2000 to 2017, while the wages of those with a high school diploma were only 2.1 percent higher than in 2000 (see Figure I). Because of the disproportionate gains for those with more credentials, it’s not surprising that the college wage premium—the regression-adjusted log-wage difference between the wages of college-educated and high school–educated workers—grew from 46.8 percent to 49.5 percent from 2000 to 2017. This rise in the college premium is primarily driven by increases for men, but their college premium actually fell from 2016 to 2017 with the decline in the average college wage (EPI 2018d). A prevalent story explains wage inequality as a simple consequence of growing employer demand for skills and education—often thought to be driven by advances in technology. According to this explanation, because there is a shortage of skilled or college-educated workers, the wage gap between workers with and without college degrees is widening. This is sometimes referred to as a “skill-biased technological change” explanation of wage inequality. However, despite its great popularity and intuitive appeal, this story about recent wage trends being driven more and more by a race between education and technology does not fit the facts well, especially since the mid-1990s (Mishel, Shierholz, and Schmitt 2013). Furthermore, changes in relative demand for college-educated versus high school–educated workers can have a direct effect on the college wage premium from either side of the equation. Often, these changes—e.g., globalization, deunionization, lowering of the real minimum wage—serve to lower the high school graduate’s wage and thus raise the relative wage of college graduates. That’s not what we’re seeing happening here. Even among college graduates, there has been a significant pulling away at the very top of the wage distribution. The bottom 50 percent of those with just a college degree still have lower wages than they did in 2000 or 2007. The 50th-percentile wage among those with bachelor’s degrees was 2.1 percent lower in 2017 than it was in 2000, while the 95th-percentile wage of those with bachelor’s degrees was 44.3 percent higher (not shown). The more salient story is not one of a growing differential of wages between college and high school graduates, but increasingly one of growing wage inequality overall and within various education groups. Figure N shows that from 1979 to 2000, the log 95/50 wage ratio grew at roughly the same pace as the wage gap between college-educated workers and high school–educated workers. While this correspondence shouldn’t be overinterpreted as education driving the 95/50 wage gap, it is true that they both grew at similar rates. The regression-adjusted college wage premium continued to grow in the 2000s and 2010s, though at a slower rate than in the 1980s and 1990s. In fact, it had slowed considerably by the mid-1990s (Bivens et al. 2014). When we compare the relative size of the changes in each gap from 2000 to 2017, it is clear that gains in the college wage premium have not been large enough to drive the continued steady growth of the 95/50 wage gap. Notes: Sample based on all workers ages 18–64. The college wage premium is the percent by which hourly wages of four-year college graduates exceed those of otherwise equivalent high school graduates. The regression-based gap is based on average wages and controls for gender, race and ethnicity, education, age, and geographic division. The log of the hourly wage is the dependent variable. The 95/50 wage ratio is a representation of the level of inequality within the hourly wage distribution. It is logged for comparability with the college wage premium. From 2016 to 2017, real hourly wages increased for many workers across the wage distribution though not for all genders and races or ethnicities nor for workers of all levels of educational attainment. A particularly bright spot in the data continues to be solid wage growth at the 10th percentile, particularly in states that have increased their minimum wage. In general, though, the years since 2000 have been associated with a continued pulling apart of the wage distribution with disproportionate gains at the top. Wages for those with additional schooling remain higher than wages for workers with less education, though modest increases in the college wage premium cannot explain the more extreme pulling away of the top earners. Rising wages over the last few years have happened during a period of falling unemployment, with unemployment rates dropping near to (or even below) pre-Great Recession lows. This is no coincidence. If the unemployment rate is allowed to continue to fall, eventually low unemployment should boost workers’ leverage enough to see steady and large wage gains. However, there is no sign that we’ve reached the limits of how much we can sustainably boost wage growth with lower unemployment—wage growth remains weaker than we should expect in a fully healthy economy. This means that confident proclamations that we’ve achieved full employment should not be made and that the Federal Reserve should hold off on any further interest rate increases and allow the economy to continue to grow. Full employment is one way that workers gain enough bargaining power to increase their wages; employers have to pay more to attract and retain the workers they need when idle workers are scarce. The “lever” for higher wages that comes from full employment is most important for workers at the bottom of the wage distribution: for a given fall in the unemployment rate, wage growth rises more for low-wage workers, and in the absence of stronger labor standards, it is often only in the tightest of labor markets that low-wage workers see stronger wage growth (Gould, Davis, and Kimball 2015). Beyond seeking to keep labor markets tight, policymakers could take other steps to foster strong broad-based wage growth, such as raising the federal minimum wage, expanding eligibility for overtime pay, addressing gender and racial pay disparities, and protecting and strengthening workers’ rights to bargain collectively for higher wages and benefits. For more policies that will raise wages, see EPI’s Agenda to Raise America’s Pay (EPI 2016). The author thanks EPI research assistant Julia Wolfe and EPI data programmer Jin Dai for their valuable contributions to this study. Source: EPI analysis of Bureau of Labor Statistics and Bureau of Economic Analysis data. Updated from Figure A in Raising America’s Pay: Why It’s Our Central Economic Policy Challenge. Source: EPI analysis of unpublished Total Economy Productivity data from Bureau of Labor Statistics (BLS) Labor Productivity and Costs program, wage data from the BLS Current Employment Statistics, BLS Employment Cost Trends, BLS Consumer Price Index, and Bureau of Economic Analysis National Income and Product Accounts. Updated from Figure A in Raising America’s Pay: Why It’s Our Central Economic Policy Challenge, by Josh Bivens, Elise Gould, Lawrence Mishel, and Heidi Shierholz, Economic Policy Institute, 2014. Notes: Shaded areas denote recessions. The xth-percentile wage is the wage at which x% of wage earners earn less and (100 − x)% earn more. 1. For more information about the CPS and CES employment measures, see BLS 2018. 2. Regression-adjusted figures are not shown in the tables in this report but are available in the State of Working America Data Library (EPI 2018d). Bureau of Labor Statistics (BLS). 2018. “Comparing Employment from the BLS Household and Payroll Surveys” (webpage). Last updated February 2, 2018. Economic Policy Institute (EPI). 2018b. Methodology for Measuring Wages and Benefits. Last updated March 1, 2018. Economic Policy Institute (EPI). 2018c. Nominal Wage Tracker. Last updated February 2, 2018. Economic Policy Institute (EPI). 2018d. State of Working America Data Library. Economic Policy Institute (EPI). 2018e. Wage Calculator. Last updated March 1, 2018. Gould, Elise. 2003. Measuring Employment Since the Recovery: A Comparison of the Household and Payroll Surveys. Economic Policy Institute Briefing Paper no. 148. Gould, Elise, Alyssa Davis, and Will Kimball. 2015. Broad-Based Wage Growth Is a Key Tool in the Fight against Poverty. Economic Policy Institute Briefing Paper no. 339.